Warsaw’s first hyper-posh rooftop nightspot is finally here, and it’s everything you imagine it to be and more. Once you clear the streetside queue (get there promptly at 22:00 or suffer the consequences), squeeze past the burly bouncers and stroll the red carpet in the lobby before entering the club in the clouds. The 360 degree bird's eye views alone are worth the trip as you emerge right in the middle of Warsaw's rapidly rising skyline. Take it all in with a bubbly cocktail in hand, but if you want a seat make sure you reserve ahead of time. Aside from A-list DJs and all-night parties al fresco and in the newly opened club space (28th floor), The View promises, above all, primo people-watching as the city's glitterati, celebs and business tycoons all crowd around the iconic circular bar. 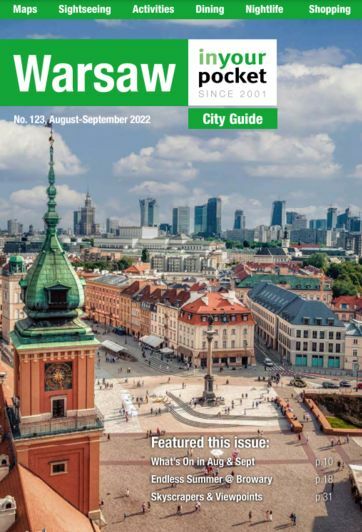 THE place to see and be seen in Warsaw. Open 22:00 - 05:00 Fri, Sat only.